The 3100H is hand operated with different sized pulleys and a rubber belt, rather than gears. Made from heavy gauge stainless steel, and comes with a lifetime guarantee. Fixed-screened basket holds 3 full-depth or 6 ideal frames. Ideals are held radially and don’t need to be turned (see photo). Full-depth frames are tangential and will need to be turned. Includes leg kit and stainless steel covers. Electric motor and speed control can also be purchased separately (POA). Which means the hand-operated machine can be upgraded to electric at a later date, as the number of your hives increases. 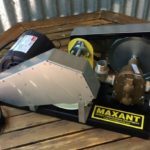 We do an order from Maxant at least once a year. Please contact us if you’d like to get one of these machines.